OTTAWA -- The federal NDP race is entering its final stretch as party members prepare to start voting for their future leader on Sept. 18. 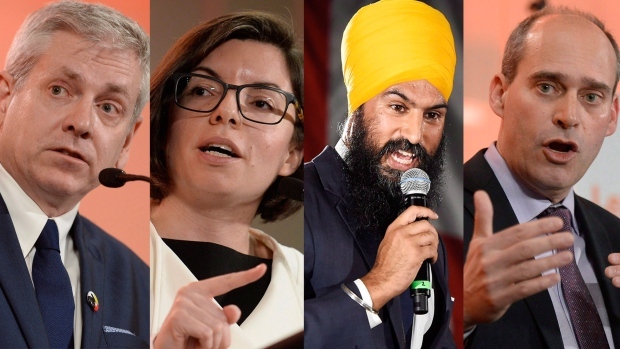 There are four candidates in the race to replace Tom Mulcair -- Quebec MP Guy Caron, Manitoba MP Niki Ashton, Ontario MP Charlie Angus and Ontario legislator Jagmeet Singh. Caron, an economist, has proposed using a basic income to reduce inequality in Canada. He is pitching a taxable supplement that would help Canadians whose income levels fall below a standard minimum threshold, determined in part by the size of their family and the city they live in. He says the idea would be designed to complement existing provincial and federal social programs, not replace them. Ashton says she wants to see the Canada Health Act expanded and revamped to include dental care. She says Canadians suffer in regions across the country because they can't afford basic dental care and often don't have private insurance to foot costly bills. The only form of dentistry covered is surgical dental work, Ashton says, suggesting this leaves many people to suffer until their issues become dental emergencies. Angus, a long-time advocate for the rights of Indigenous children, has proposed the creation of a federal ombudsman who would have the legal authority to order government departments to comply with policies aimed at improving child welfare. He would also work with the parliamentary budget officer to calculate the cost of delivering service to Indigenous Peoples, adding it is necessary to end the "culture of secrecy" on funding for communities. As part of his criminal justice platform, Singh plans to create a federal ban on racial profiling -- an issue he has been outspoken about as a provincial legislator in Ontario. He says he knows first-hand what it's like to be racially profiled during arbitrary street checks often known as "carding." Singh says the practice sends a destructive message to people of colour like himself.